Jimmy Smith looks over his day’s calls. A memorial service has been scheduled to celebrate the life of former 1st District Humboldt County Supervisor Jimmy Smith at 5 p.m. Friday, May 27, at the Jimmy Smith Fields Landing Boat Launching Facility. Former 1st District Humboldt County Supervisor Jimmy Smith has died. He was 67. Smith, who tirelessly served the 1st for more than a decade, left his position in 2012 due to a cancer diagnosis. He had struggled (and largely prevailed over) the disease since the 1990s. A lifelong Humboldt County resident, Smith attended Eureka High School before going on to a varied career as a commercial fisherman, harbor commissioner and waterfowl researcher. He was voted in as supervisor for the 1st District in 2000. His tenure as supervisor was marked by a statewide budget crisis and a controversial lawsuit by then-District Attorney Paul Gallegos against the Pacific Lumber Co. Smith was known for a hands-on approach to his job, personally inspecting rural roads and promptly responding to concerned emails and phone calls from constituents. Former 1st District Supervisor Jimmy Smith, a native of Humboldt County whose kindness and dignity will leave a lasting impact on our community as great as his work, died last night at St. Joseph Hospital in Eureka. He was 67. The County of Humboldt will fly the U.S. flag at half-staff in Supervisor Smith’s honor. Born on July 11, 1948, Smith was known as a man of caring, grace, humility and perseverance. He had a distinguished career in public service and his accomplishments were of major significance to Humboldt County. Smith set the gold standard for inclusiveness and bridging differences to solve problems, and his leadership and diplomacy resonated throughout northern California. 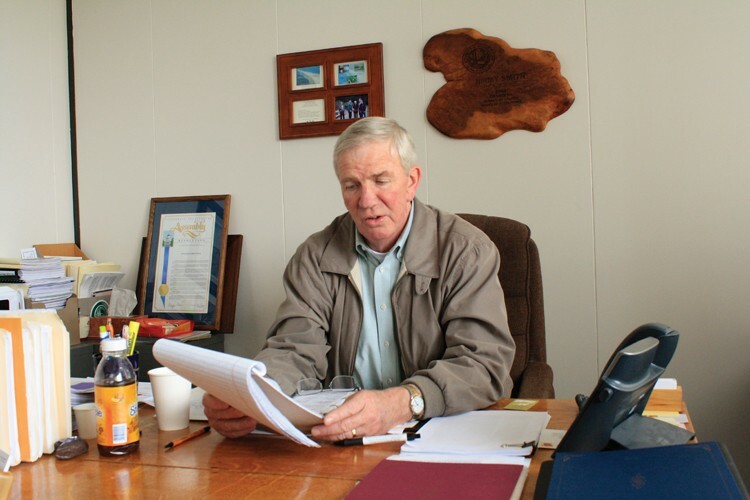 Smith served as a Humboldt County supervisor from January 2001 to August 2012 and as a commissioner with the Humboldt Bay Harbor Recreation and Conservation District from 1995 to 2000. Also a commercial fisherman for more than 40 years and former wildlife biologist, Smith was dedicated during his career to the conservation of natural resources and the public’s use and enjoyment of those resources. Smith championed many large projects and initiatives for the benefit of natural areas, working landscapes, and fish and wildlife. He performed significant work on Humboldt Bay, Salt River, Eel River, Trinity River, Klamath River and marine fisheries. One of Smith’s major accomplishments during his career was anchoring the diverse county, state, and federal team that achieved the clean-up, public acquisition, re-opening, enhanced protection, and ongoing effective management of the land located directly across the bay from Fields Landing, now known as the Mike Thompson Wildlife Area, South Spit Humboldt Bay. Known for his unique ability to bring people together to build trust and goodwill, Smith was a primary visionary and co-founder of the seven-county North Coast Integrated Regional Water Management Plan (now the North Coast Resource Partnership) and the Five-Counties Salmonid Conservation Program. In November 2014, the Board of Supervisors named the Fields Landing Boat Launching Facility in Smith’s honor. He was instrumental during the prior 20 years in building partnerships and securing funding for improvement projects at the launching facility, which serves as the primary boating access to the southern portion of Humboldt Bay. Some of the improvements include a new boat ramp, improved lighting, a tsunami siren, increased parking and new floating docks. The facility is open to the public and benefits a variety of users including sport fishermen, clammers, crabbers, waterfowl hunters, canoeists, kayakers and birdwatchers. Smith retired from his position as supervisor in August 2012 for health reasons. The Board held a lengthy item with comments from the public in appreciation of Smith’s service prior to him leaving office. Smith leaves behind Jacque, his wife of 40-plus years, and their son, Gary. We will update with information on any memorial services that are open to the public. -	Resolutions, from the California State Senate and the California State Assembly.